The Parliament of the Democratic Socialist Republic of Sri Lanka (Sinhala: ශ්‍රී ලංකා පාර්ලිමේන්තුව Shri Lanka Parlimenthuwa, Tamil: இலங்கை நாடாளுமன்றம்) is the supreme legislative body of Sri Lanka. It alone possesses legislative supremacy and thereby ultimate power over all other political bodies in the island. It is modeled after the British Parliament. It consists of two hundred and twenty-five (225) members known as Members of Parliament (MPs). Members are elected by proportional representation for five-year terms, with universal suffrage. Parliament reserves the power to make all laws. The President of Sri Lanka has the power to summon, suspend, prorogue, or terminate a legislative session and to dissolve the Parliament. President can dissolve Parliament only after the lapse of 4 1/2 years or if 2/3 majority of Members of Parliament requests him. The Speaker or, in his absence the Deputy Speaker and Chairman of Committees or the Deputy Chairman of Committees, presides over Parliament. Parliament has the power to make laws, including laws having retrospective effect and repealing or amending any provision of the Constitution, or adding any provision to the Constitution. The 1947 opening of the first parliament at Independence Square by Prince Henry, Duke of Gloucester in the presence of D.S. Senanayake, the first Prime Minister of Ceylon. The first legislature established in Ceylon was the Executive Council and the Legislative Council, which were established on March 13, 1833 according to the recommendations of the Colebrook-Cameron commission. The Executive Council was composed of the Colonial Secretary, the officer commanding the Military Forces, the Attorney General, the Auditor-General and the Treasurer. The duties of the council were advisory and the Governor of Ceylon, who presided over their meetings and consulted them, was at liberty to disregard their advice. At first it was made up of only British officials but later included native citizens. At the beginning 16, and later 49 members, were elected for the Legislative Council, but a limited number of people were qualified to vote. In 1931 the Legislative Council was dissolved and in its place a more powerful State Council of Ceylon was established with its 101 members elected by universal adult franchise as provided by the Donoughmore Constitution. Prior to the granting of independence and the establishment of the Dominion of Ceylon on 4 February 1948, a new bicameral parliament was established in 1947, according to the recommendations of the Soulbury Commission after the State Council was dissolved. It was based on the Westminster model with an upper house, the Senate, whose members were appointed and a lower house of parliament, the House of Representatives, whose members were directly elected. The House of Representatives consisted of 101 Members (increased to 157 in 1960) and the Senate consisted of 30 Members, of whom 15 were elected by the House of Representatives and 15 nominated by the Governor-General of Ceylon. The Senate was abolished on 2 October 1971. On 22 May 1972 when the republican constitution was enacted, the House of Representatives was replaced with the National State Assembly which had 168 elected members. This itself was replaced by the Parliament of Sri Lanka when the constitution of the Democratic Socialist Republic of Sri Lanka was enacted in 1977. In 1987, a grenade was lobbed into a conference room inside the Parliament complex where government MPs were meeting. Two people were killed and sixteen injured, but the target of the attack, President J. R. Jayawardene escaped unhurt. The Janatha Vimukthi Peramuna claimed responsibility for the attack. Of the 225 members, 196 are elected from 22 electoral districts, which are multi-member. The remaining 29 MPs are elected from National Lists allocated to the parties (and independent groups) in proportion to their share of the national vote. A person adjudged guilty by a competent court or by a Special Presidential Commission of Inquiry. When Parliament first meets after a general election, it will elect three members to serve as the Speaker, Deputy Speaker and Chairman of Committees (known simply as the Deputy Speaker) and the Deputy Chairman of Committees. Whilst presiding, the Speaker or Deputy Speaker wears ceremonial dress. The Parliament Secretariat, headed by the Secretary General of Parliament, is in charge of all its administrative duties. Until 1972, the post was known as Clerk of Parliament. The Secretary General is appointed by the President, subject to the approval of the Constitutional Council. The Sergeant-at-Arms is responsible for the maintenance of law, order, and security on the House's premises and acts also as master-of-ceremonies. The Serjeant-at-Arms carries the ceremonial mace, a symbol of the authority of the People and of the Parliament, into the House each day in front of the Speaker, and the Mace is laid upon the Table of the House during sittings. Currently, the parliament secretariat administration is divided into eight departments. The Staff Advisory Committee (SAC) established under the Parliamentary Staff Act provides advice and guidance to the Parliamentary Secretariat with respect to matters concerning Parliamentary staff. The SAC consists of the Speaker (Chairman), the Leader of the House, the Minister of Finance and the Leader of the Opposition. Secretariat maintains the Speaker's Residence and the Madiwela Housing Complex for MPs and the nineteen-roomed holiday bungalow for MPs, General's House in Nuwara Eliya. Parliament also owns Mumtaz Mahal which was the former residence of the Speaker and Srawasthi Mandiraya the former hostel for MPs. These are now used by other government entities. The old Legislative Council Building, Colombo Fort. Today houses the Ministry of Foreign Affairs. Under the British Colonial government, when the Executive Council and the Legislative Councils were set up in 1833, they met in a building opposite Gordon Gardens, which is now the "Republic Building", occupied by the Ministry of Foreign Affairs. On January 29, 1930 the British Governor of Ceylon, Sir Herbert Stanley (1927–1931), opened a building fronting the ocean at Galle Face, Colombo, designed for meetings of the Legislative Council. 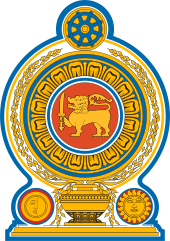 It was subsequently used by the State Council (1931–1947), the House of Representatives (1947–1972), the National State Assembly (1972–1977) and the Parliament of Sri Lanka (1977–1981). Today the Old Parliament Building is used by the Presidential Secretariat. In 1967 under Speaker Albert F. Peris, the leaders of the political parties unanimously resolved that a new Parliament building be constructed on the opposite side of Beira Lake from the existing Parliament at Galle Face, but no further action was taken. While Stanley Tillekeratne was the Speaker (1970–77), the leaders of the political parties entrusted the drawing up of plans for a new Parliament building to architects, but the project was subsequently abandoned. On July 4, 1979, Prime Minister Ranasinghe Premadasa obtained sanction from Parliament to construct a new Parliament Building at Duwa, a 5 hectare (12 acre) island in the Diyawanna Oya (off Baddegana Road, Pita Sri Jayawardenapura-Kotte) about 16 kilometres (9.9 mi) east of Colombo. The island was where the palace of the King Vikramabahu III's powerful Minister Nissaka Alakesvara had been situated. It had belonged to E. W. Perera prior to being vested in the state. The building was designed by architect Deshamanya Geoffrey Bawa and built with Sri Lankan funds. On April 29, 1982, the new Parliamentary Complex was declared open by President J.R. Jayewardene. ^ "Ranil takes oath as PM: MoU signed for national govt". Sri Lanka Mirror. 21 August 2015. Archived from the original on 4 March 2016. Retrieved 23 August 2015. ^ "Sri Lanka main opposition party agrees to form national government with ruling UNP". ColomboPage. 20 August 2015. Retrieved 23 August 2015. ^ "Sri Lankan president warns Mahinda Rajapaksa loyalists against toppling government". The Economic Times. 9 September 2015. Retrieved Sep 11, 2015.